Mick Mulvaney, acting director of the Consumer Financial Protection Bureau, is trying to take a database intended to hold financial institutions accountable offline, ending the public’s ability to file and view complaints. The database (tagline: “How one complaint can help millions”) is currently available here. 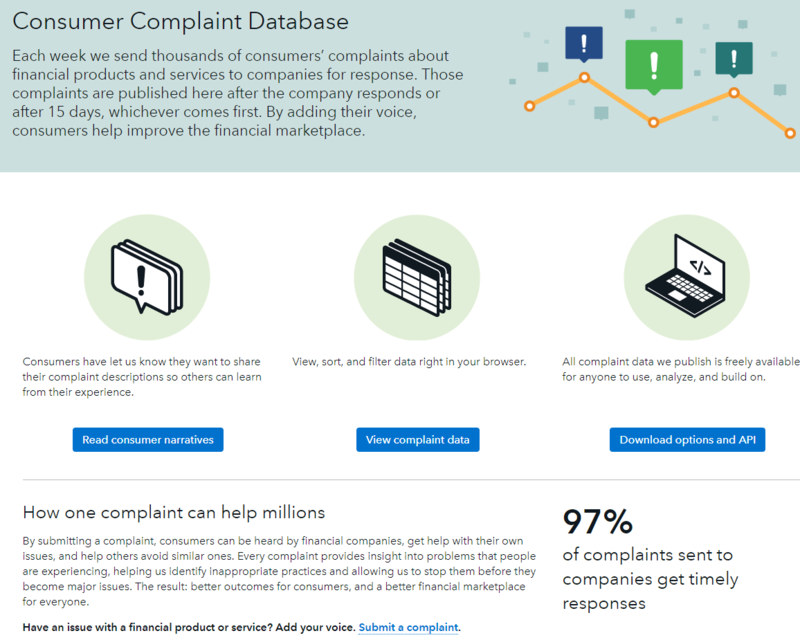 Americans have filed more than one million complaints through the database, helping regulators decide which firms need to be investigated. The National Highway Traffic Safety Administration and the Consumer Product Safety Commission maintain similar public complaint databases. A Freedom of Information (FOIA) lawsuit brought by the Reporters Committee for Freedom of the Press (RCFP) is compelling Customs and Border Protection (CBP) to release hundreds of pages of documents on its unsuccessful attempt to “unmask” the identity of Twitter users maintaining an account critical of the agency and the Trump administration’s immigration policy. In March 2017 CBP sent Twitter a summons “ordering the company to provide certain records relating to the @ALT_uscis account, including user names, account login, phone numbers, and mailing and IP addresses.” Twitter filed suit, arguing the summons violated its First Amendment rights, prompting CBP to withdraw its summons and Twitter to voluntarily dismiss its claims. RCFP filed a FOIA request after CBP withdrew its summons. “The request also includes all records, including guidelines and directives, that discuss any laws CBP could use to compel the production of records to unmask the identity of people using databases, social media, and other software, as well as any records discussing laws that would allow someone who receives a summons to object to compliance with such summons.” RCFP filed suit after CBP failed to respond in the statutory time-frame and withheld records without listing the exemptions used to justify the withholdings. The first release of responsive documents can be read here, here, here, and here. CBP is required to process 500 pages in response to the suit every 30 days. The Koch Foundation released a statement in defense of their gift practice saying, among other things, that the foundation hadn’t been allowed to make final appointments – only to recommend candidates. The Archive has filed a FOIA lawsuit against the CIA in federal district court seeking 12 specific cables from November and December 2002 that were authored or authorized by Gina Haspel, the acting director of the CIA as of last week. The cables describe the torture of a CIA detainee under her supervision. The Defense Department is seeking – for the fourth time – a new FOIA exemption that would withhold unclassified military, tactics, and techniques. The proposed language is vague and raises concerns that the exemption could potentially be abused to justify withholding much of the information created by the DOD. The proposal also raises the questions: 1) why the unclassified material that the DOD is attempting to withhold cannot be classified and withheld under FOIA’s exemption 1 that already shields “properly classified” national security information; and 2) why the DOD continues to propose the exemption without input from the congressional committees that oversee FOIA? The Chicago Tribune won the release of the Chicago Police Department’s gang members database through a FOIA request. The database, which is shared with other law enforcement agencies, contains 128,000 names and, according to criticisms, is replete with inaccuracies, outdated information, and is racially skewed. After a series of public meetings held by the Chicago Inspector General and complaints that people aren’t notified when they are added to the list or able to appeal to be removed, the Chicago Police Department announced that it would make changes to the database. This week the National Security Archive’s Cyber Vault’s Cyber Brief entry highlights North Korean cyber-operations. This brief includes remarks by James Clapper on cyber-deterrence and North Korea given while he was Director of National Intelligence, a significant report by Kaspersky Lab on North Korea-linked advanced persistent threat (APT) group Lazarus, a letter from Congress to Treasury Secretary Steven Mnuchin expressing concern over Lazarus cyber-operations targeting banks in 18 countries, an alert by the US Computer Emergency Response Team (US-CERT) on North Korean botnet activity, and a Congressional Research Service brief on North Korean capabilities in cyberspace.